Are Your Gutters Properly Pitched? Residential gutters might seem like fairly simple pieces of hardware, but if they’re not installed correctly they may not be able to effectively discharge water away from your home. This is because gutters must be pitched slightly toward their downspouts to ensure rainwater is able to flow freely without getting trapped along the way. As a general rule of thumb, your gutters should slope down from their peak at least one quarter inch for every 10 feet of gutter. So how can you tell if your gutters are properly pitched? An easy way to make sure water is flowing through your downspouts is to inspect your gutters following a rainstorm. If you can see any standing water in your gutters and it’s not being blocked by debris or other obstructions, the pitch of the gutters is likely too shallow. In some cases, you may be able to correct isolated gutter pitch issues by gently bending the gutter hanger in the affected area to allow water to drain into the downspout. If the pitch problems are more widespread, however, you may need to have your gutters rehung by a professional installer. If your gutters were originally hung by professionals and have been properly maintained, you shouldn’t have to worry too much about pitch problems unless they’re damaged by something like a falling tree limb. You’re also less likely to encounter pitch problems with seamless gutters because they must be custom cut to suit the unique dimensions of your home. Interested in learning more about all the benefits of modern seamless gutter systems? Give us a call or contact us online to speak with a representative at Bell Seamless Gutters today! A new gutter system can ensure that rainwater drains safely away from your roof, protecting your home or office from water damage during storms. But before you get your new gutter system, it’s important to prepare your home for the installation process. 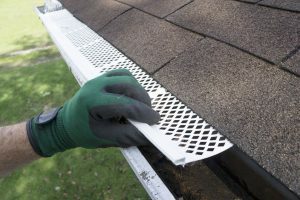 Once your old gutters have been removed, take this opportunity to inspect your home’s soffits and fascia boards for signs of mold, mildew and rotting wood. If you identify any of these issues, have them repaired before your new gutters are installed. This will maximize the lifespan of your new gutter system and prevent isolated sections of rotting wood from becoming more widespread in the future. After your existing gutter system is removed, you’ll probably notice some chipped paint and general wear and tear at the edge of your roof. It’s a good idea to repaint these areas before the new gutters are installed to make sure they’re properly sealed against moisture. You can also replace any missing or damaged siding at this point, too. This is the most important step in gutter installation prep: make sure you know where that rainwater is going. A new gutter system won’t do you much good if it isn’t tailored to the unique drainage conditions around your home. Our gutter installers can work with you to identify potential drainage issues and resolve them before you get your new gutters. This way, you can be confident in their ability to effectively drain water away from your home. Interested in replacing your home’s old gutter system with modern seamless gutters? Give us a call or contact us online to request your estimate today! Don’t worry about getting your mind out of the gutter. If you want your home to function seamlessly, having knowledge of your house’s gutter system is vital. Why? Well, there are a number of misconceptions about gutter systems which can result in unfortunate repercussions if they go unnoticed. 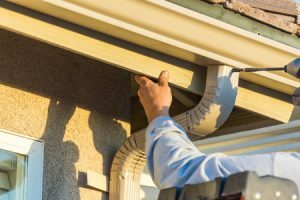 That’s why the team at Bell Seamless Gutters has drafted up a quick breakdown of what you need to know when it comes to your home’s gutter system. While the task may seem intimidating at first, we sincerely promise you that it will be worth your time. Why Should I Care About Gutters? If adequately maintained, gutters can offer a host of benefits, including soil stabilization and erosion prevention that preserve landscaping and turf. Building officials across the country are now requiring gutters for residential construction, due to the fact they protect against long-term foundation problems. For example, rain gutters can protect against water damage and staining, as well as prevent cracking on patios, driveways and sidewalks. Why Should I Maintain Gutters? When gutters go uncleaned, it can cause a number of problems including water damming and leaks into your home’s interior. Not only that, but clogged gutters are often breeding grounds for mosquitoes due to standing water. They can also cause fire hazards if leaves are left to accumulate. How often you should clean out your gutters ultimately depends on a number of factors, such as the proximity of trees to the roof line and slope of the roof. As a general rule of thumb, you should clean your gutters thoroughly at least twice a year. Far too many houses do not have complete and up-to-date gutter systems. If you’re wondering whether your home fits this description, first start by making sure you have seamless gutters on every sloped roof edge. From there, you should assess whether your gutters hold standing water (they should not), leak (also, no), and have downspouts that are safely fastened to your home’s exterior. Downspouts should also discharge water far away from your home’s foundation on a downward slope. Need a hand getting the gutters on your home in good working order? The experts at Bell Seamless Gutters can help! Give us a call today or contact us online to speak with a representative. The use of seamless gutters is becoming increasingly popular for many homeowners. Due to their ease and functionality, and their overall attractive appearance, seamless gutters are an obvious better choice, for their high quality design, and for the look and appeal of your home. Seamless gutters have many advantages over traditional gutters; such as greatly lessening the chance of leaks. Traditional gutters must be attached to each other, piece by piece, which can leave spaces for rain to fall through. They are also easier to install; and many handy DIY’ers will find it simple to install seamless gutters, but for most people, professional installation insures that they are installed correctly. Quality gutters are highly important because they protect the foundation of your home, by directing rainwater away from the foundation. The benefits of using seamless gutters over traditional gutters are numerous. Here are just a few of the most important advantages. 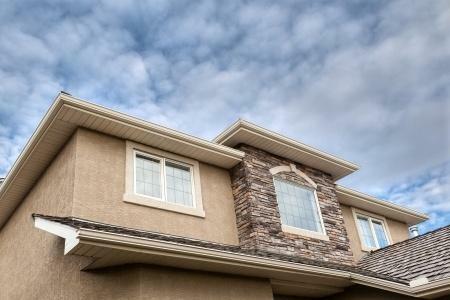 Seamless gutters are far more attractive and add great visual appeal to the outside of your home. They are more tailored to the look of your home, because seamless gutters are installed with exact measurements. Most importantly, they help to reduce the chance of rain leaks, which can cause erosion of the gutters and create puddle and trenches in the ground below the gutters. Seamless gutters are more easily and quickly installed because unlike traditional gutters, each piece does not need to be fastened to the other. There are some seams at the corners and the downspouts only, they are very securely sealed to greatly reduce the chance for leaks. Most seamless gutters come with an enamel finish, so there is no need for painting. And seamless gutters can come in many colors, so you can choose a color that best matches your home.